Another popular one - this thread tracks OEM specific PIDs for the Toyota FRS / Subaru BRZ platform. Post here on any knowledge or research you might come across. Great idea for a thread, the FRS/BRZ/GT86 really needs this as it has the oil temperature buried in the OBDII. Would be great if someone could tell me how to set this up on my racecapture as it's the primary reason I bought it for my GT86 Racecar. Does the latest version of the app now let you customise the OBDII PIDs? Thanks for that. The combination of the 2.11.0 firmware (releasing this week) and the 1.9.0 software allows the customization of OBDII PIDs on top of the built-in support for SAE standard channel presets like RPM, TPS, EngineTemp, etc. This week we'll also be updating our OBDII guide to illustrate how this works. Perfect cheers Brent, I've updated the android app just need to update the racecapture/track firmware. I will see what other FRS/BRZ PIDs I can find and update the thread. oil temp and brake pressure are close to the top of the wishlist. Attached is the data i've found but will need to put it into recapture correctly. That's where i need help! Hi! 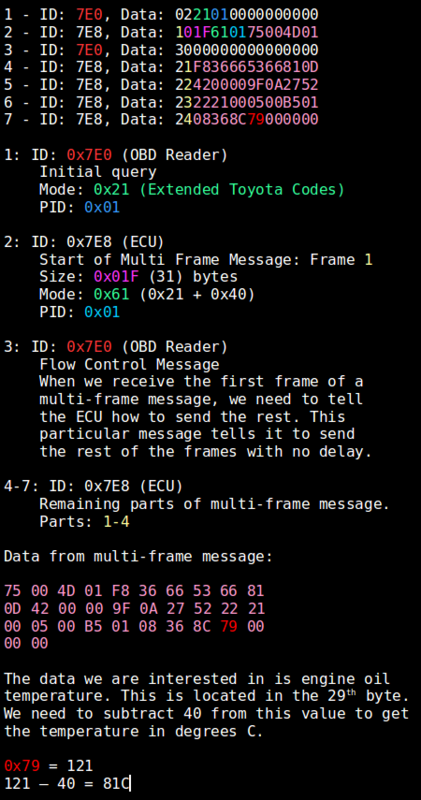 So, those look like SAE standard OBDII PIDs - didn't see any OEM specific (mode 22) PIDs in there. You can map these by creating a new OBDII channel, and setting the mode, PID and the proper conversion formula. We have pre-set OBDII PIDs for the SAE standard channels we feel people would be most interested in- all you have to do is select it and all the other settings are pre-populated. If there's another PID not in our dropdown list, try making a custom mapping and see if that works. Post your testing results here! One non-standard pid for the FRS/BRZ would be the oil temperature PID. This is a PID 0x01 with mode 0x21. The response is a multiframe message. Something like this would be nice to support. Thanks. Do you have additional information on what other channels might be in that multi-frame message? You are correct Brent, yes that list was the standard ones, some of they may be handy but really the oil temp is the one I imagine we all want, and it wasn't in there anyway! Just not sure if or how this can be used with RC maybe not supported as above?